Gravitational waves might be the cause of two new live image, spin off projects released today by members of the openSUSE community. The release of Argon, which is a live installable image based on openSUSE Leap, and Krypton, which is a live installable image based on openSUSE Tumbleweed, offer packages built for KDE Git using stable and tested openSUSE technologies to track the latest development state of KDE software. Users have a choice on how they get up-to-date packages of Qt and other additional cutting-edge offerings from KDE through the Argon and Krypton live installable images, built directly from the latest sources in KDE git through the Open Build Service. Argon and Krypton can be either used as live images, without changing an already installed system, or they can be installed, providing a full-stack KDE software environment. This will allow developers, early testers and enthusiast adopters to experience the latest happenings in KDE software development, while at the same time being able to report bugs and improve the software before a stable release lands. openSUSE’s Argon and Krypton become the first to offer a continuous stream of KDE software updates by putting the Git builds in the hands of users the way KDE intends it. 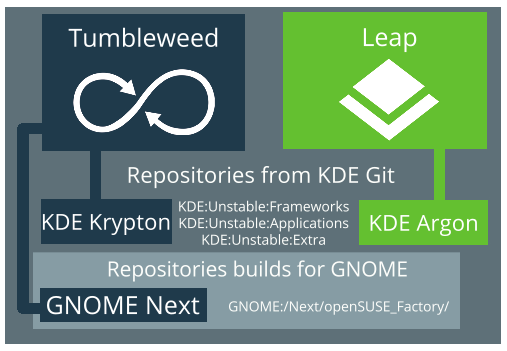 openSUSE has an extensive experience in providing almost-daily Git snapshots of KDE software: the Unstable OBS repositories have been running without issues for several years. Thanks to this expertise, creating Argon and Krypton from Git snapshot is a rather simple endeavor, facilitated by the infrastructure provided by the openSUSE Project. Packages are directly based on the Git repositories and not on any alpha, beta tarballs. These packages are refreshed at least daily. The below build numbers will change based on rebuilds. GNOME – Next, which is similar but different than Argon and Krypton, is based on tarballs. GNOME – Next is from the unstable branch of GNOME, currently 3.19.x, but will soon be 3.21.x. For that repo to work, occasionally it reaches beyond GNOME packages with libinput and various hardware libraries to build. I can see why opensuse would want to do this given the Neon project. Just goes to highlight how owncloud is slipping through opensuse’s fingers. Despite being built in OBS, and having a great upgrade service through the Leap, it is far easier to set up and manage owncloud on Ubuntu if only because the tools and documentation for HTTPS/apache etc. I’m a lifelong suse/kde fan who loves YAST, but my next owncloud install might be on Xenial for this reason. Deploy OwnCloud in openSUSE is easy. In fact, CODE is openSUSE based. agreed, deploying oc is easy. deploying it well is not. https, mariadb, etc is not. Quick note though: the x86_64 Argon/Krypton images are missing checksum (.sha256) files. Also, it would be really nice if (at least) the checksum files were retrievable over a secure connection – this way you could quickly verify them without needing gpg knowledge/key management/… (if you don’t need that additional security). If you only know English… (like myself) too bad. Had to try to decipher the obscurity behind the jargon. means that the other version [“Leap” – but they think everyone knows this) is not rolling. So it must be periodical, really demanding periodic re-installation of the newest version of the whole operating system. “Rolling” updates usually allows continuous, micro-updating, rather than periodic massive updates that take more time & trouble when updating. “Rolling updates”, theoretically means that the computer should never need to be turned off. But this is theory, rather than practice. What is not said is that the “repositories” for openSUSE are supposed to be RPM type files. RPM files are so incompatible with so many RPM versions of Linux, that the only versions suitable to be used are those created by the official openSUSE coders. This hostility to 3rd-party creators of applications and drivers is not the same for the users of DEB Linux operating systems, afaik. Hopefully my understanding of Linux is wrong. Is it? Please let me know. Tried all three, I was unable to get to a working live (they all reboot after a series of errors) or a working install. Leap or Tumbleweed work fine on the same hardware. Yeah, only luck I had with the images was on a VM. OpenSuse is one of the least pleasant outfits to deal with when a problem arises. The various forum respondents are contemptuous and/or condescending, and none is to be bothered with giving an answer to a simple question. The specific problem that I encountered is that when I use a LIVE DVD/CD, I am confronted with a login screen past which I cannot proceed. There is NO hint of what UserName or password to use. This happened with Leap and with Argon editions – separate ISO’s. Actually, the problem is not limited to live CD/DVD. A full installation of Leap resulted in the same problem – a waste of time and effort. Very disappointing.